In reaction to increasing oil prices and unrest in Libya, speed limits on Spanish motorways have been reduced from 120kph (75mph) to 110kph (68mph). 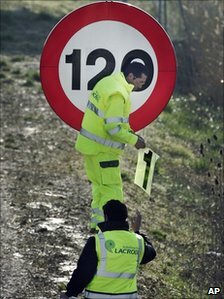 Throughout Sunday 6th March, workers worked to cover the old 120 signs with 110 stickers, in excess of 6000 signs, a cost estimated to be in excess of 250,000 Euros. The speed limit is planned to be reduced for only 4 months. Travellers to Spain are warned to be aware of the new limits or risk on the spot fines.